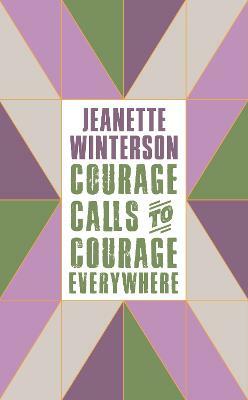 Courage Calls to Courage Everywhere is a timely and inspiring call to arms by one of Britain's most acclaimed and important writers. Whilst recognising how far women have come in the hundred years since getting the vote, Jeanette Winterson also insists that we must all do much more if we are to achieve true gender equality. Examining recent women's rights movements, the worlds of politics, technology and social media and changes in the law, Winterson calls out all the ways in which women still face discrimination and disadvantage. Like the women who won the right to vote, we need to shout up, reach out, be courageous and finish the job. Also included in this volume is Emmeline Pankhurst's landmark Suffragette speech, 'Freedom or Death', which she delivered in 1913. This is truly a small but powerful book. Winterson has always been an unusually honest writer, especially about her own life and experiences, and here she examines the truth of women’s lives in the twentieth century. In her usual calm but determined style she writes of issues and points of information that surprise, confirm and inspire the urge to do something, look at the world in a different way, and not to accept the status quo easily. Winterson is skilled at looking at the world in a slightly different way in order to question it, but does so with such good humour that this book, like so many of her others, is an enjoyable if challenging read. The book opens with the tale of a game which was designed by the Women’s Social and Political Union, featuring suffragettes and police. This is a subtle way into an account of the suffrage movement of the early twentieth century. While many 2018 books took quite a stern view, and rightly so, of the way that suffragettes were treated, this book cleverly links the events and personalities of the twentieth century with those of the twenty – first. It emphasises the importance of Manchester in the fight for the women’s vote. The struggle for the vote in this book is not always a middle class one; Winterson mentions women such as Annie Kenney. She deals with the inequalities that still exist today in the same astonished way as she writes about the recent discrimination of Oxbridge colleges, financial limitations, and the popular, mistaken, concept that women and men’s brains differ in some way. This is a book of protest about the existing differences in employment and life choices that are dictated by gender; the reader is left in no doubt that differences continue to this day. The book also contains a speech, “Freedom or Death” given by Emmeline Pankhurst in Hartford, Connecticut, on 13th November 1913. This obviously gives an insight into the battle for the vote at first hand, as well as the treatment which the suffragettes endured up until that point. This is not a scholarly book, though it is full of facts. It informs without overburdening with details. One or two facts surprised me, and I enjoyed discovering them in such a useful little book. For this is a book that is quickly read, but worth keeping for picking up and referring to over a longer time. It is not a simple book, though it flows so easily that it is a most enjoyable read. The quote on the back; “Behind every Great Woman is a Man who tried to Stop Her” does not sum up the book; this is not an angry book but an upset one. It is the sort of book to read yourself and give to others, a small gem of its type, and represents extremely well the thinking of feminists at this exciting time.